As The Challenge: Rivals 3 winds down, the drama picks up! Picking up from last week, per usual, the house goes out to party. With the drinks pouring, people always want to vent their feelings at the club! Christina admits to Nate that she's nervous and drained with being in the house. Nate tries to boost her mood, but knows Christina needs to toughen up in order to make it further in the game. Meanwhile, Nany talks to Cory about the alliance between their teams, trusting that he has her and Wes' backs. However, Nicole thinks that Cory is making deals on the side and doesn't trust him. With good reason. Cory is also in cahoots with Bananas and Vince, and tries to downplay it. He thinks that he has two different deals in case something falls through, though really Bananas and Vince are secretly playing him! The next day, T.J. pops up at the house, and tells the ladies to step outside. He then follows them out, without saying a word to the guys! With the girls gone, the guys don't know what to do. After dinner, Bananas and Vince go to their room, during which Devin takes the opportunity to talk strategy with the other guys. He states that if they can team together and get rid of either Bananas or Vince, they can gang up on the other. Cory doesn't feel like "it's the right time," but, for the rest of them, it definitely is. 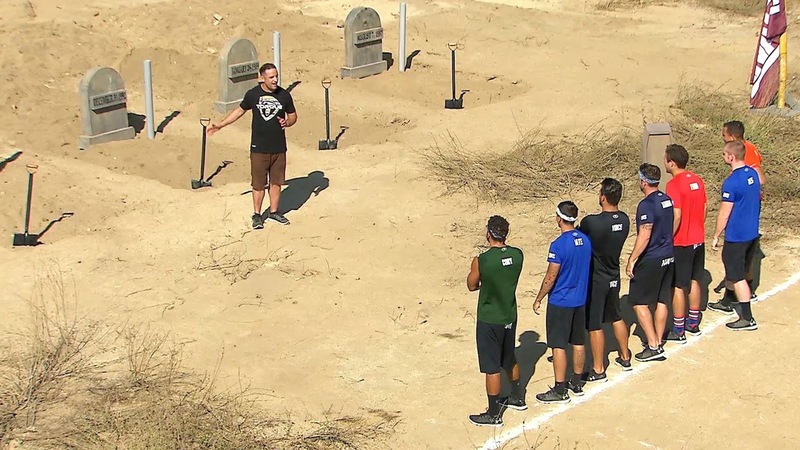 At the day's challenge, "Take It To The Grave," the guys arrive to the news that the girls are currently buried alive!!! Of course, they all cheer and applaud! T.J. lets them know that this challenge is actually a trivia game. When the girls were taken, they were asked a series of questions, and now the guys have to guess their answers! There are different markers on the ground. If their answer is correct, they move up one. If they don't, they stay where they are. Once each guy answers enough questions, he has to find his partner by the birthday on her headstone and start digging. The first team to to ring the bell wins the challenge for the day! Because he won in The Jungle, Wes gets to choose three teams to start one marker behind everyone else. Easily, he chooses Bananas and Vince, along with Cory as well. From there, T.J. starts grilling them as the girls scream and cheer from their coffins. T.J. starts out with basic questions like the girls' eye color and weight, but then it goes deeper as he asks about each team's biggest ally, the team they're gunning for, the team who's considered the lay up, etc. It's putting a lot of things out on the table about how people feel and could start some drama back at the house! Dario and Bananas manage to finish first on the questions, and race to save their partners. Dario manages to get Nicole out of the coffin first, and they ring the bell, winning for the day! It's definitely a huge victory for them, especially this late in the game. Slowly but surely, the other guys start finishing up, except for Nate. He is on the last mark, but struggles to answer the last question, so Nate and Christina end up losing and will head straight to The Jungle. The two of them get in an argument right there since Nate feels like Christina came up with stupid answers. Honestly, I'm really surprised they've gotten as far as they have. Later, Dario and Nicole talk about who they could potentially throw in, and Nicole admits a secret that Nany told her. She tells Dario that his friend Cory went to Wes and Nany to strike an alliance. With he and Cory supposed to have each other's backs, Dario takes serious offense. At their power dinner, Nicole and Dario decide to potentially switch things up and side with Bananas and Sarah. Later, Nicole and Dario call out Cory for his side deals. At nominations, things get really heated when Nicole and Dario vote in Cory and Ashley and then Devin and Cheyenne. It's a mess, because the rest of the teams talked about throwing in Bananas and Vince every time if any of them won, and they walked away completely unscathed! Dario definitely had the opportunity to make a power move, but says that he didn't because of things that went on behind his back. Wes argues back and forth with Dario about how he went back on their entire conversation and voted in teams that had their back! That's true, because, honestly, Bananas (though I'm rooting for him and Sarah) and Vince never will. This whole thing causes serious friction in the house. Cory and Dario aren't speaking now. Nany and Nicole get in a fight because Nicole exposed Nany's secret, and potentially change some things for her and Wes. It's crazy! All this drama means that the teams are really dwindling down, and we're getting closer to that Final! With all that money at stake, people are playing for themselves, and clearly not always thinking things through. At The Jungle, skulls are pulled to see if Cory and Ashley or Devin and Cheyenne will face Nate and Christina. With both Ashley and Cheyenne pulling white skulls, we get a cliffhanger on if Cory pulled the last white skull or the black!